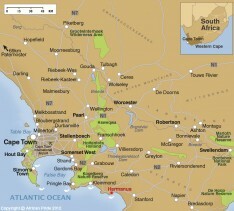 Located to the south-east of Cape Town lies the pristine stretch of South African coastline known as the 'Whale Coast'. Here, as the name suggests, between August and November every year whales come in-shore to calve and can be seen from as close as 10 metres from the coastal cliffs and beaches providing the best land based whale watching opportunities in the world. Hermanus, set in the very heart of the Whale Coast, has developed from a rustic whaling and fishing village into one of the world’s best whale-viewing sites (via land or boat). It’s also home to the world’s only Whale Crier, who signals whale locations using a kelp horn. 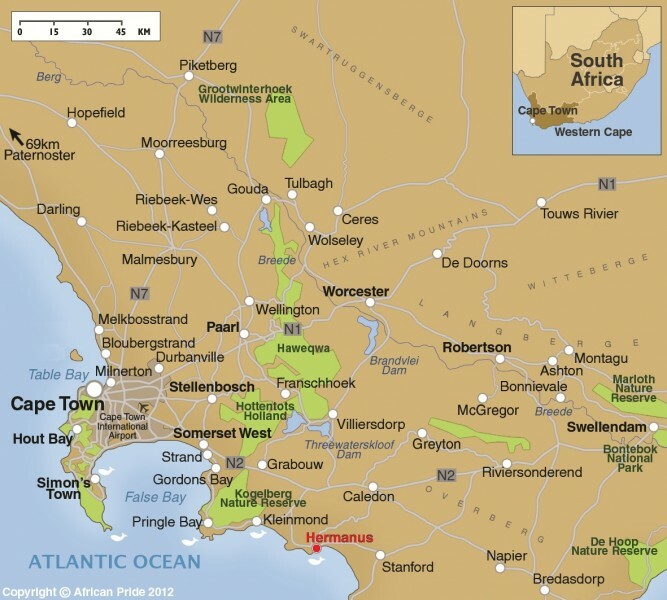 The other main coastal town is Gansbaai, known as "Big 2 Town" as you can see both the Southern Right Whale and the Great White Shark here. Meanwhile, the often overlooked Swellendam makes for a perfect stopover between Cape Town and the Garden Route.